This article is attributed to the Autorenkollektiv (a term from the former GDR for a combined effort). It was submitted anonymously via an intermediary on behalf of an averred husband and wife team living in Switzerland. 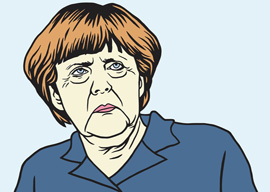 Angela Merkel has been Chancellor of Germany for twelve years. Of all the leading politicians in Europe, only Vladimir Putin has been in power longer.